Our prayer chaplains are here to hold sacred space, pray with you, listen to you, and support you with your spiritual needs. Unlike hospital chaplains, Unity Renaissance prayer chaplains are not ordained. They are not here to “minister” to the community at large, nor are they trained to counsel. The chaplains are a lay resource to help meet the pastoral care needs of our spiritual community. They make monthly prayer and wellness calls to participating congregants and pray with individuals on request. All requests for prayer are held in strictest confidence. You may sign up for a monthly call from a prayer chaplain by clicking here. Prayer chaplains are also available to pray with congregants before and after each Sunday service. Look for them wearing the purple stoles. The mission of the Prayer and Pastoral Care Team is “to encourage awareness of Spirit within, and inspire a way of life that brings love, freedom, peace and joy.” In support of this mission, the chaplains reach out to provide prayer, comfort and support to those in need. Participating in off- and on-site training each year. 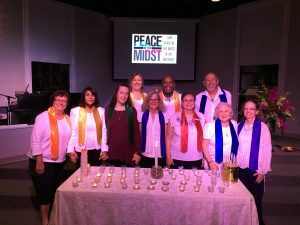 The first Unity Renaissance Prayer Chaplain Team was trained in the fall of 2003 and inducted during Sunday services on December 7, 2003. Interested in Becoming a Prayer Chaplain? If you would like to learn more about the Prayer Chaplain Program at Unity Renaissance and how to get involved, please plan to attend one of our annual chaplain orientation sessions. Attending one of these orientation sessions is mandatory for all those who wish to participate in the necessary training to become a prayer chaplain. Feel free to speak to one of our chaplains or the Prayer and Pastoral Care Director to learn when the next orientation session is scheduled, or check the annual calendar here.